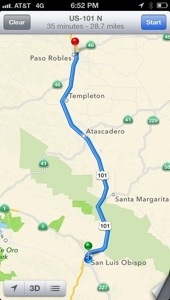 The plan for tonight was to arrive in Paso Robles for dinner before settling in for the night. But here we sit in a parking garage just 30 miles away in San Luis Obispo at 7 p.m. and five miles of charge, making that hope impossible. We left Santa Maria after charging for two hours to break up the monotony. We drove part of the way on back roads to save charge. The ride was spectacular. 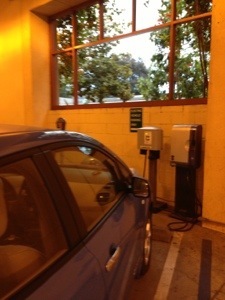 There are three charging stations in the Marsh Street Parking garage. And yes, there are plenty of places to eat here. But I am tired and whiney from being on the road for 12 hours and it sure would be nice to be there already. It is incredibly frustrating to be 28 minutes from a place with no way to get there for at least 2 1/2 hours. We have some major uphill facing us in this last stretch of the night during this, our return trip to Silicon Valley from Malibu. Therefore we cannot skimp on charging. Such is EV living. My husband just returned from finding a restroom and informs me that the Barnes & Noble around the corner has plenty of plugs to charge my phone.